Xiaomi recently launched Redmi Note 7, the latest smartphone in the highly popular Redmi Note series. Redmi Note 7 continues the series’ tradition of featuring a large display and excellent battery life, and pushes smartphone photography to a new level in this price range. Redmi Note 7 will be available from March 27, with prices starting at P7,990. “We are marking our second year in the Philippines inspired by our Mi Fans’ strong love of Xiaomi, which propelled us to become the best-selling brand in the biggest online sales events last year,” said Steven Shi, Head of Southeast Asia, Xiaomi Global. “As we update our multi-brand strategy in January with Redmi becoming an independent smartphone brand, we are strengthening our commitment in the Philippines by launching the latest device under the superior quality yet extremely cost-effective Redmi brand, the Redmi Note 7. This comes with an 18-month warranty, making sure that Filipino Mi fans will be able to get the best out of the device,” he said. Redmi Note 7 Nebula Red. Redmi Note 7 marks the greatest shift in design in the series, sporting a new premium style with the front and rear covered in Corning Gorilla Glass 5. The gorgeous 19.5:9 Dot Drop display measures 6.3 inches diagonally and has an FHD+ resolution of 2380 x 1080. The Redmi Note 7 screen’s high pixel density and accurate colors (84% NTSC color gamut) offers one of the finest visual experiences in its class. On the back, Redmi Note 7 sports the Samsung ISOCELL Bright GM1 backside illuminated CMOS sensor that has 48 million physical pixels. When taking pictures, the sensor uses Samsung’s Tetracell technology that merges four pixels to work as one large 1.6µm pixel. This greatly increases light sensitivity and makes the resulting 12MP image much brighter and clearer, even in low-light conditions. Xiaomi couples Redmi Note 7’s cameras with the latest AI features, including the night mode photography feature that was introduced along with Xiaomi’s flagship Mi MIX 3, as well as AI scene detection, AI beautify and AI portraits that allow users to create amazing photos with ease. 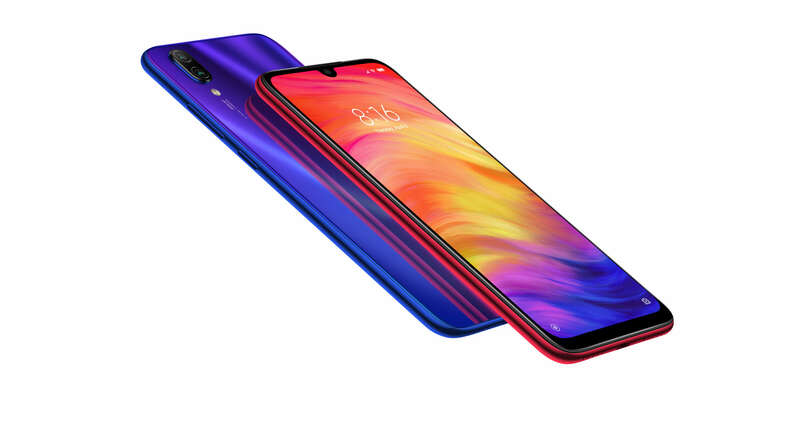 Redmi Note 7 carries on the Redmi tradition of excellent battery life with its large 4000mAh battery, which will last over a day for almost all users. Recharge via the USB Type-C port, and enjoy shorter charging times thanks to support for Qualcomm Quick Charge 4. Redmi Note 7 also includes an IR blaster capable of controlling numerous home appliances, such as televisions or air conditioners. In addition, it comes with Smart PA audio for louder and higher-quality sound.